There are lots of things to consider when it comes to replacing an old kitchen benchtop. For many people the cost alone can make their decisions but there are other factors that come into play. Laminate benchtops are made from plastic-coated synthetic materials making them the low-cost option for a kitchen renovation. Unlike stone countertops which are heavier and more difficult to cut to precise measurements, laminate reduces costs by being made from more readily available materials and by being a easier material to work with. Beyond cost laminate bench tops are strong, moisture resistant and durable. When it comes to the most demanding environments laminate lets you rest easy knowing that your countertop is up to the hardest jobs. Because laminate’s are man-made they also come in the most diverse range of colours, patterns and textures allowing you to truly customise your kitchen. 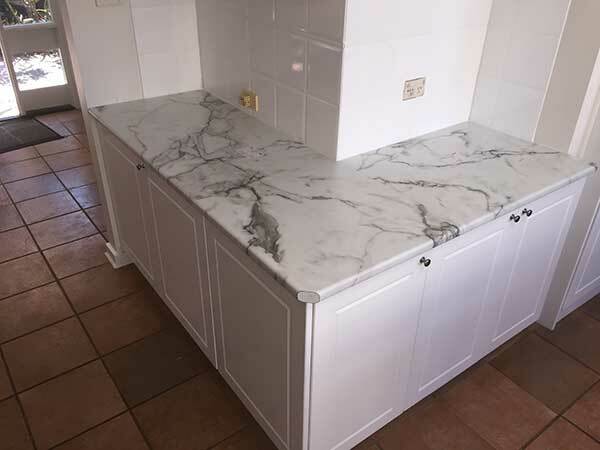 They even come in designs that mimic natural stone surfaces allowing you to have a benchtop that looks like granite at a fraction of the price. If you’re thinking of upgrading and bringing a new sense of life to your kitchen give the team at Just Benchtops a call and we can provide you with a laminate benchtop designed to fit the unique dimensions of your kitchen.